It might not have been the most reliable Seven, but it got me hooked. 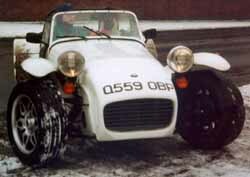 Seven number one was a white, 1986 de Dion car, with a 1700 SuperSprint engine, a five-speed gearbox, and flared wings. I bought it from Paul Matty Sportscars in January 1996; I thought I did quite well just surviving the trip home - a snowy motorway is not the ideal introduction to Seven ownership, and I had quite a bit of difficulty keeping it within the bounds of one lane at sixty miles per hour. There were bad omens from the start. In May, the engine blew up at the Lotus Seven Club track day at Mallory Park. Due to some initial bad advice about the severity of the damage, I decided to replace the crossflow engine with a Zetec. The new engine (2.0l, 165bhp on carbs with 3D mapped ignition) was supplied by Paul Dunnell, and was fitted by James Whiting, who both did excellent jobs. Due to the age of the car, most of the components that can often be reused in the conversion (alternator, exhaust, etc.) had to be replaced, bringing the total cost of the conversion to about £5000. The transplant was worth it though - it was great to be able to do two track days ( Cadwell Park and Brands Hatch) without constantly checking the oil and water. In September I found myself in Yorkshire with fellow daily sevener Brian Poulton, on our way to meet up with Tony Boyd (another daily nutter) for a weekend of Scottish fun. Alas, I didn't make it that far. We were on quiet country roads, where about one car every five minutes came the other way. Approaching a tight right-hand bend, I could see that I needed to slow down. Getting closer, I saw that the bend was on the brow of a large hump, so I slowed even more. Unfortunately I did not see the loose gravel on the road, and the back-end of the car broke loose when the car lightened, cresting the brow. It wasn't a huge slide - given a bit more room I'm sure I could have regained control, but the one car every five minutes decided to come along at just the wrong moment, and being slightly over the central white line, I hit it, front-right corner of my car against front-right of a Nissan Primera. Most of the details are irrelevant. The Nissan driver was shocked(! ), but otherwise OK. I had a 1.5-inch cut down to the bone on my right shin, and tiny hole on my left shin, also to the bone. These were caused by my legs flying up and hitting the underside of the scuttle. I believe that my right leg got the worst of it because my right foot would have been on the throttle or brake pedal (and hence nearer the scuttle), while my left foot was probably resting on the floor. I had no whiplash effects, which the ambulance crew simply could not believe until I showed them the four-point harness in my car. 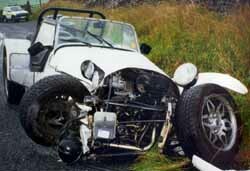 The damage was estimated to cost about £8000 to fix, because the chassis was bent all the way to the back of the car (the windscreen cracked because of the twisting forces applied to it), but the engine seemed to have escaped without damage. This page is http://www.strangely.org/owned/seven1.html. It was first published on Friday 4 August, 2000 and last updated on Tuesday 11 January, 2005.